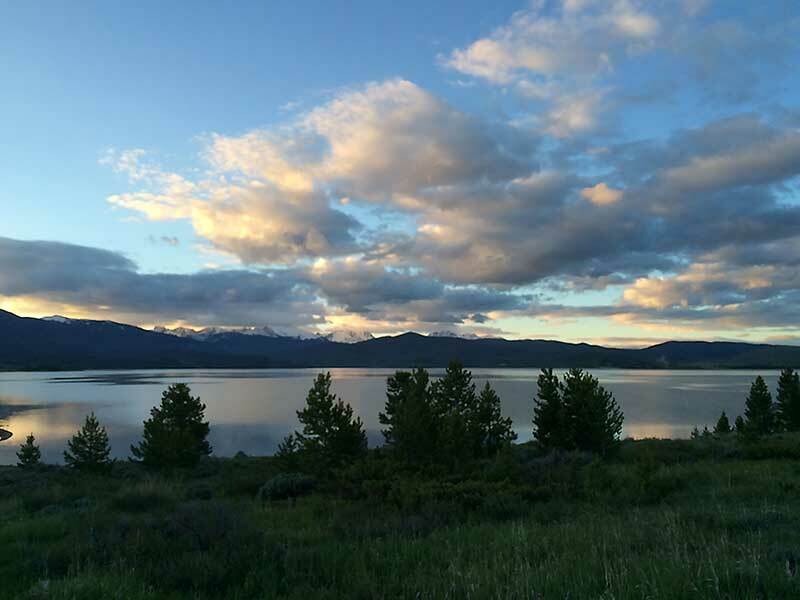 Name: Bob Sanders Backpacking Background: I went on my first backpacking trip as a Boy Scout at the age of 16. Over the years I have hiked the Wonderland Trail in Washington and section hiked parts of the Florida Trail, Appalachian Trail, Colorado Trail and 740 mi (1191 km) of the Pacific Crest Trail. I continue to backpack and hike year round in the Colorado mountains. I have evolved from a heavyweight backpacker to a lightweight backpacker and sometimes reach ultralight weights. My three day winter/spring solo adventures (using a tent) have me hovering around a 15 lb (6.8 kg) base weight. The company "Good To-Go" was started by a chef and her husband in Maine. As a chef she even appeared on Food Network's "Iron Chef" and beat the Iron Chef, Mario Batali. That is an incredible accomplishment and I think it shines brightly on what a great chef she is. I can't wait to taste these meals. The other thing that I am very impressed with is their approach to making these meals. A quote from their website pretty much says it all "When we cook our Good To-Go meals we make them just like you would at home". 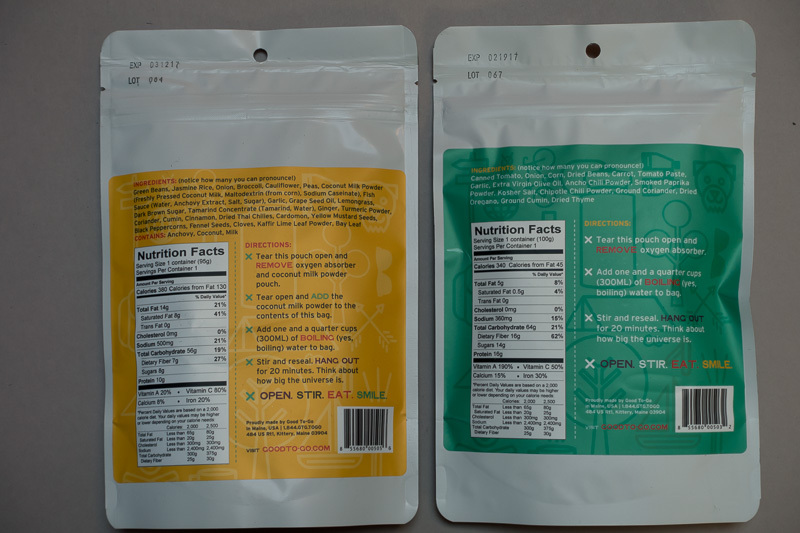 Both of these meals are made with dehydrated ingredients, not freeze dried. When you look at the back of each package and read the ingredients list every single ingredient I recognize and can pronounce. The other thing I notice is that they use really good ingredients, not the cheap stuff. For example you see "Extra Virgin Olive Oil and Grape Seed Oil" instead of "Canola Oil or Corn Oil". They also list all the great herbs and spices they add, not just "spice blend". This tells me that they are very proud of the ingredients. What is not included in the ingredient list are any trans-fats or preservatives. I personally think this is a great omission. The packages themselves seem quite robust, so I don't foresee them tearing or bursting in my pack. At the top of each package is a tear notch on each side and they have included a zip style closure to seal the package while I wait for the food to dehydrate. There is an expiration date listed on the back of each package. The Thai Curry has an expiration date of 3-12-17 and the Chili is listed at 2-19-17. About 2 years, so not bad for an edible product with no preservatives. The other noticeable feature is that these meals contain no meat. They are listed as vegetarian and gluten free. The directions are also listed on the back and are quite simple. Tear open the pouch and remove the oxygen absorber. The Thai Curry had an additional step to remove the coconut milk pouch and add to package contents. Then you simply add 1.25 cups (300 ml) of boiling water, stir, reseal and hang out for 20 minutes. After a long day on the trail, that is my king of cooking. The calorie content is pretty good for a package of this weight. The Thai Curry clocks in at 380 calories and the Chili a little less at 340 calories. I'm a big guy so 380 calories is not enough to replace the calories I burned on the trail. I normally look to consume 600-700 calories for an evening meal. For me an additional appetizer or side, dessert and a beverage would round things out quite nicely. Another nice touch that I think reflects on the gourmet taste and quality of these meals is (listed on their website) they suggest what beer, wine or spirit would pair nicely with each meal. Now that's gourmet eating in my opinion! Like I mentioned earlier I can't wait to get out on the trail and taste these meals. After I posted my Initial Report I received three additional meal packages. 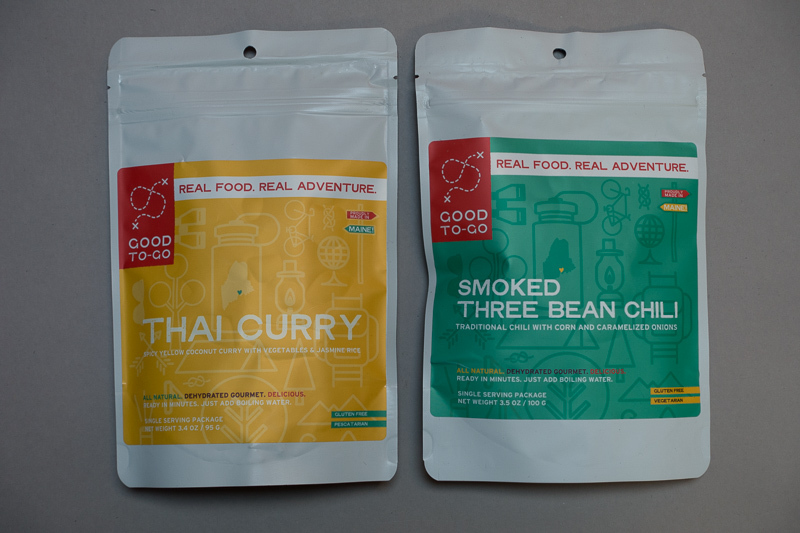 One additional Thai Curry, one additional Chili and a new flavor of Herbed Mushroom Risotto. 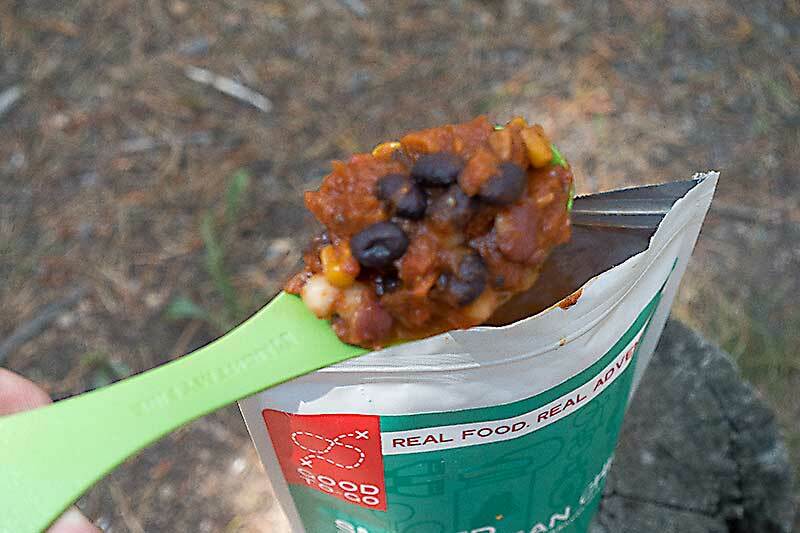 For this day hike I grabbed my cook kit and alcohol stove with plans to stop for lunch and have a hot meal. I brought the Smoked Three Bean Chili with me because I thought chili just sounded good on a cool day. Around noon I found a sunny spot to have lunch and try out this chili. Preparation was simple, add 1.25 cups (300 ml) of boiling water to the pouch, stir, reseal the pouch and wait 20 minutes. After 20 minutes I tried a spoonful. Texture looked good (chunky) and the smell was kind of chili-like but more tomato aroma. At 20 minutes of dehydrating the corn and black beans were still a bit crunchy. I resealed the package, wrapped it in my down jacket and let it sit for another 10 minutes. Another sample and the corn was still pretty chewy. After another 10 minutes I decided I was going to eat it no matter what. After 40 minutes it was edible and only slightly chewy. The taste was not very spicy with only the hint of chili flavor. The flavor of tomato was much more dominant. Consensus: 40 minutes seems a long time to rehydrate a meal. I do understand that at 9,500 ft (2,895 m) the elevation may have been a factor in the lengthy rehydration. Overall the texture was great and the taste was okay. Next time I would bring a bottle of hot sauce to kick it up a notch. This time I took along the Herbed Mushroom Risotto. Same prep as the chili. Add 1.25 cups (300 ml) of boiling water to the pouch, stir, reseal the pouch and wait 20 minutes. After 20 minutes I took a peek. The consistency was kind of runny. My initial instinct was I screwed up and added too much water. I rechecked and I had added the right amount. I decided to seal it back up and wait another 10 minutes hoping it would thicken up a bit. After allowing more time it did not seem to be any thicker. The aroma was quite nice with the smell of mushrooms being dominant. The taste was good but a little bland. Consensus: Again the altitude may have contributed to the dish not hydrating quite right. If I were to eat this dish again I would use less water and add some salt and pepper to give it some additional flavor. Thai Curry was on the menu for this trip. Same prep as before. Add 1.25 cups (300 ml) of boiling water to the pouch, stir, reseal the pouch and wait 20 minutes. This time after 20 minutes the texture looked good, the aroma was fantastic and the consistency was spot on. No crunchy or chewy bits. The flavor was spicy but not over the top. I like spicy food and I found this to be quite flavorful. I was disappointed when I got to the bottom of the pouch. I wanted more! Of the three meals the Thai Curry was the shining star. The chili and the risotto each had their issues. With some minor tweaks both would become palatable. Both needed some extra flavor and the risotto needed less water. For my money I'm just going to stick with the Thai Curry for future outings. My normal cook kit always includes an insulated cozy. I did not use it in the preparation of these meals. In the future I will be using it and I think it would have helped with the rehydration process, especially for the chili. The packaging is quite robust and held up well in my pack. The serving size was a bit small for me. I would need to bring additional food items to make it a complete meal. The company Good-to-Go gets a big plus for keeping the ingredients simple and eliminating ingredients that are unhealthy. A two year shelf life without preservatives is also quite an achievement. 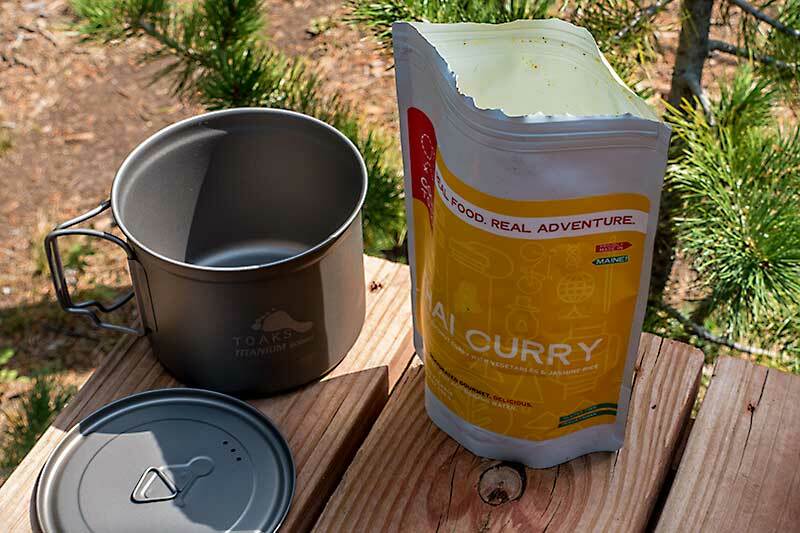 I would like to thank BackpackGearTest.org and Good To-Go for the opportunity to test these meals.